We love Labradoodles and want to share our enthusiasm with you. Our aim at Kimberlenes is to breed healthy, happy Labradoodle puppies who will grow up into great family pets, that are genetically sound with wonderful temperaments. We have been breeding Labradoodle puppies for over 15 years and are now reaping the rewards of our carefully managed breeding and monitoring programmes. We breed both medium and standard Labradoodles. Unlike Australian Labradoodles, which can be the result of using several different breeds, we only use Labradors and Poodles in our breeding programme. Indeed, it is surely a misnomer to describe dogs with a mixture of breeds in their background as Labradoodles. Our view is that this is actually very misleading and likely to cause much confusion. 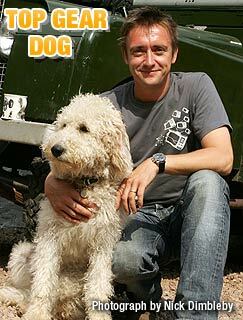 Richard Hammond with the latest member of the BBC2’s Top Gear team – probably the best looking, definitely the best behaved! Another Kimberlenes puppy. A classic Kimberlenes puppy graces the cover of this new ‘My Labradoodle’ DVD. Kimberlenes Poppet also appears on the back and the DVD cover. Kimberlenes Buttercup in action on the cover ofThe Field, March 2009 with Kimberlenes Daisy leading the article on cross breeds inside. Bruce Fogle, the well known veterinary surgeon and author, recommended one of his regular clients to visit Kimberlenes and this photograph shows him vetting Kiki, the puppy they chose. Blue Moon: a really exciting new addition to our breeding programme – a stud dog with an unusual fox red coat, a hip score of 7 and a perfect elbow score of 0. Pluto : Our fantastic stud dog with a great BVA hip score of 4 – by far the best scored multi-gen Labradoodle stud dog standing in the UK today. Kimberlenes Crocus, with the perfect hip score of 0/0.